The 1911, for over 100 years this has been the workhorse and standard from which all other semi-automatic handguns have been judged. Even the most die-hard polymer gun-lover can't deny the visual beauty of a well made 1911. A well tuned 1911's performance can put a smile on any shooters face. Besides the lore and heritage of the 1911, what draws many owners to the 1911, is the fact that the gun can be modified in so many different ways that owners can have fun building a truly customized firearm, built exactly to their preference. Some of these modifications are purely cosmetic, while others drastically impact performance and function of the gun. There are some obvious mods, that 1911 owners have probably done or thought about, grip panels, sights, adjustable trigger and spring kits are all very popular. A while back I was introduced to a 1911 modification product that intrigued me. At the time I didn't have a suitable 1911 that I could install the product on for the review. So time passed, and eventually I got a baseline 1911 that I could install the product on and perform a thorough evaluation. Over a few months, I broke in my Rock Island Armory .45 1911 GI model. The only change I made to the gun, was changing the stock, wood grips to some aftermarket VZ type grips. Other than the grips, the gun was stock. Springs, sights, trigger and everything else was just as it was from the factory. For those of you who read my articles know, I particularly like to find the ‘not so well-known' products that can help shooters and gun enthusiasts. So I contacted the people over at Cammer Technologies, and asked them if it was possible to get my hands on one of there ‘Cammer Hammers' for an evaluation. They sent me a Stainless Steel Cammer Hammer 17-4 Hammer / Sear Combo for this evaluation. While Cammer Technologies loaned me the product for free in order to do the evaluation, I particularly like the fact that when I spoke with Bob Corkrean at Cammer Technologies he said: “Please make sure you give us your honest opinion. Good, bad or whatever you find.” So rest assured this review (like all my reviews) is unbiased. I am not an engineer, but from reading up on the hammer and studying the components and internal operation of the 1911, I have found that the easy explanation of how the hammer works is like this. The shape of the hammer is designed to change the angles between the hammer and slide, which changes the force needed to rack the slide. This seems simple enough, but the hammers design, and reduction in force needed to rack the slide has many benefits. First, and probably most obvious it that it makes it easier to rack the slide. This is great for those with reduced hand strength, or those compact 1911's that have a little stiffer recoil spring and can be a little more challenging to rack. Yes, I know what you are thinking, can't I get a reduced weight recoil spring that makes racking the slide easier? Yes, there are spring kits that allow you to change the weight, but changing the recoil spring weight needs to be done carefully. Proper balancing of the recoil and main spring weight is necessary for proper function. Even with proper balance, lighter recoil and main springs can lead to reliability issues while extracting, ejecting and chambering with various types of ammunition. This is a great thing about the Cammer Hammer, you can use it with your stock weight recoil spring. Secondly, and thirdly, muzzle rise and felt recoil is said to be reduced. I was curious as to how this could be achieved simply by changing the hammer. While my actual findings are described later in the article, I studied and found that while a big component of muzzle rise and felt recoil is due to the pressure created by the cartridge, there are a myriad of factors that play a part in muzzle rise and felt recoil. Mechanical design of the firearm, weight of the firearm, composition of the firearm, type of ammunition, and even grip technique, and others all play are all part of the equation. But how does the hammer factor into the muzzle rise, recoil equation? It would seem that the hammer allows for less initial resistance to the slide's movement to the rear. The resistance is equal thoroughout the slide's movement, and only encountering the resistance at the most rearward position of slide travel. This seems to help reduce muzzle rise and the felt recoil. This is because with proper grip of the firearm once the slide is in its reward position there is less muzzle rise because the rearward momentum is more transferred into your arms, and managed by your arms and, rather than your hands and wrists. Additionally, a reduction in the resistance the slide encounters as it cycles to the rear, and less of a ‘slamming' of the slide on the hammer as it moves to the rear, theoretically could lessen the muzzle rise and felt recoil created by this process. How is the install and fit : As 1911 owners know, there are tons of aftermarket ‘drop in' products made to modify your gun. But ask anyone who has purchased ‘drop in' aftermarket products and they will tell you that most of the time there has to be some slight modifications done to make the product fit their specific model. There are so many different types of 1911's that while they are nearly identical, they have some very slight differences that can cause a problem. The Hammer / Sear combo is a great option because often times, simply buying an aftermarket hammer requires it to be matched to the gun's sere. The mating angles between the sere and hammer are critical in proper function and performance. For those with a GI model 1911 or other 1911 models that have a standard grip safety, you will need to upgrade your grip safety to the beavertail model. The beavertail grip safety is standard with those 1911's that have the target ‘skelletonized' hammers. My RIA 1911 GI model had the standard grip safety. There is simply not enough clearance for the hammer with this type of safety. 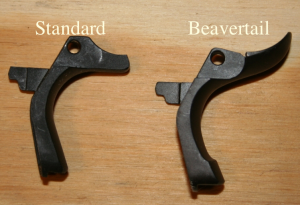 You can pick up a beavertail safety for anywhere from $35.00 – $150.00 depending on your preference. I am a huge proponent of gunsmiths when it comes to modifications of your firearms. I know we all have a ‘buddy who can do it', or can watch a You Tube video of how to replace parts of our firearms, but when tinkering with the internal function of a 1911, much can go horribly wrong. If spring tension and angles are not proper, the result can be an extremely dangerous firearm. For this reason, I chose to have all the work performed by a highly competent gunsmith. I am lucky enough to live in Columbus, Ohio and have access to Joe at Velocity Works. They have a full service gun shop and gunsmith shop on site. Not only is the service awesome but they really know what they are doing when it comes to building and modifying a 1911. As you can see in the pictures, my 1911 is blued, and the hammer I had installed is pricelessly machined 17-4 stainless steel. There is also bar stock steel version that matches a blued finish. Personally I don't mind the difference in materials and like the look on my 1911. Because the quality of the 17-4 stainless steel is incredible, it is smooth as silk, creating top performance trigger feel. How does it perform : Before sending any rounds down range, I simply had to see if the Cammer Hammer really lived up to its claim to fame and had any effect on the force needed to rack the slide. Sometimes it is hard to compare something without having the two items side by side. In this case, it was not necessary. The Cammer Hammer in fact made a noticeable difference in the force needed to rack the slide. It was remarkably easier than with the stock hammer. 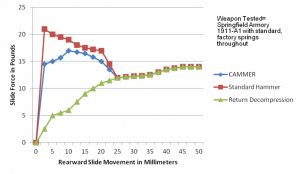 Now I do not have a scientific way to quantify the difference in required force, but here is a chart from Cammer Technologies web page illustrating their tests on racking force. My experience with the Cammer Hammer definitely backs up these claims. I found that it felt smooth and easy to rack the slide back. The force needed to rack the slide was consistent throughout the entire movement of the slide backwards. Instead of typically needing more initial force and then reaching a point where the amount of force needed drops off. It may not sound like a big deal, but it creates an unbelievably easy, smooth and consistent racking force. The guys at Velocity Works actually commented that initially they were ‘skeptical about the claims' that the hammer would really make it easier to rack. After the install all of them said it was a tremendous improvement and much easier to rack. This is coming from guys who handle and work on budget and custom 1911's all the time. I was also excited to see the way the Cammer Hammer effected how the trigger felt; I mean the feel of a 1911's trigger is one of the perks of owning one. Not to mention, it can make a world of difference in the ‘shootability' and feel of the gun. As I stated above, the stock, non adjustable trigger was not changed. I was BLOWN AWAY, by the way the trigger now felt after installing the Cammer Hammer. 1911 owners who have adjustable triggers know that changing the over-travel and reset of the trigger can have dramatic effects on how the trigger feels. Gun owners even put a huge emphasis on trigger pull-weight. What is often times overlooked is what is referred to as trigger ‘creep'. Trigger creep is the movement in the trigger between when the hammer begins disengaging from the sere and when it is fully released. 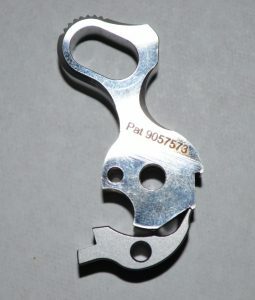 A trigger with no ‘creep' is recognized by a ‘crisp' break. A trigger with a lot of creep can feel ‘spongy' or inconsistent in its break. The Cammer Hammer produced an amazingly smooth trigger feel with zero creep. The pull weight actually felt lighter (although it was not) the pull was consistent throughout and didn't ‘build up' right before the hammer released. It felt like Joe had done a high end trigger job on my 1911, simply by changing the hammer and sear. Joe told me that he has done a lot of trigger jobs and ‘obviously the tolerances of the hammer and sear are really precise.' He went on to explain that the ‘high quality of the materials and tolerances created a de-facto trigger job.' All the guys at the shop said they were now ‘believers' and Larry at the shop said that if he were building a 1911, he would ”definitely put one in. Because they didn't get to go out and put a lot of rounds through it, they were anxious for me to get back to them about if it helped decrease muzzle rise. The claims of reduction in muzzle rise and felt recoil are harder to prove or disprove without high speed cameras and suitable gun vices. They are also more personal and somewhat subjective. 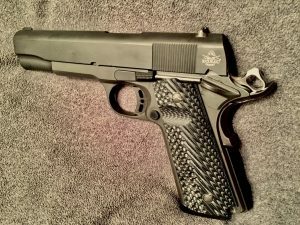 Because I fired several hundred rounds through the gun before the modification, I went to the range with a good idea of how the 1911 felt prior to the instillation of the Cammer Hammer. I fired another several hundred rounds through the gun. This was not simply a slow fire plinking test of the gun's performance. As someone who focuses more on self defensive shooting more than anything else, I wanted to really see how the gun would perform if someone to use this in their carry gun. I found the gun did feel very responsive and follow up shots were accurately on target. This could be due to a lot of things (none of which was the weather, as there was snow on the ground and it was 29 degrees out). I could not quantify a difference in muzzle rise or felt recoil but I can definitely say it felt smooth throughout the cycle while firing multiple shots during rapid fire. As I stated I cannot quantify ‘reduced recoil' or ‘reduced muzzle rise' but the gun just maintained a good feel throughout the 100 round test period. As great as a product looks or feels, reliability is critical to any component you put in your firearm. I simply will not accept any product that compromises the reliability of my firearm. So part of my evaluation was shooting a relatively large volume of rounds through the gun and record any malfunctions. Prior to the instillation of the Cammer Hammer, over the corse of around 200 rounds, I had 2 times where the gun failed to lock to the rear on an empty chamber, and one failure of the slide to fully cycle forward back into battery. This initial test was done in similar weather conditions as the test after the Cammer Hammer was installed. Other than those malfunctions, I did not experience any failure to extract or failure to eject type malfunctions. I then fired roughly 200 rounds through the gun with the Cammer Hammer installed. I experienced zero malfunctions. No failure of the slide to lock to the rear on an empty chamber or anything else. For this reason, I can unequivocally say that the Cammer Hammer is a reliable component when installed corectly. What is my conclusion : With many high price modification out there, the Cammer Hammer is relatively economical. At $128.00 for the Stainless Steel Hammer / Sear combo, and $153.00 for a complete ignition kit, you really get a lot of upside for not a lot of money invested. My Rock Island Armory, which comes with arguably the smoothest stock feel of all budget to mid grade 1911's, felt like an entirely new , high end piece after the hammer install. What I found is that the Cammer Hammer ‘Hammer / Sear Combo' is a beautifully machined hammer that is a ‘must' modification for 1911 owners who have any difficulty racking the slide on their gun. It is also a tremendous upgrade for those wanting to better the performance of their trigger without having to spend a lot of money on an aftermarket trigger job. Performance is not degraded, in fact I experienced fewer malfunctions during my limited test. I think this is is a modification that blinkers, competition shooters and even concealed carriers can get behind. I am not big on trigger modification of your every day carry gun. Mainly because most of the time the mod people want to perform is simply reducing the trigger pull weight, which I don't recommend. This is a modification that does not reduce the trigger pull weight, it simply smooths out the pull and makes it more responsive, while allowing the gun to be easier to control and rack. All things that are beneficial to concealed carriers. Competition shooters can also definitely benefit from the Cammer Hammer and their complete ignition parts kit. In addition to the hammer and sear, the ignition parts kit includes a spring kit, hammer strut, disconnector and main spring cap. All of these are high performance and machined parts that are intended to really boost the performance of your 1911. To sum up my opinion of this Cammer Hammer, I would say the hammer/sear combo is an unbelievable value. To be able to smooth out and lighten the force needed to rack the slide, produce a crisp and clean trigger feel, and produce the feeling of reduced recoil and muzzle rise for around $100-$150! How could you possibly go wrong? The guys at Cammer Technologies have a great product and I couldn't be happier with the install by Joe at Velocity Works. I have a suspicion that the Cammer Hammer is going to be a go-to mod for a large number of 1911 owners!